On Jan. 25, the State Duma adopted an “anti-tobacco” bill that will ban smoking in public places, cigarette sales at kiosks and smoking scenes in films and cartoons. Most Russians oppose a total ban on smoking in public places, but smokers will have less than a year left to adjust to the new rules or kick the habit altogether. In 2008, Russia joined the World Health Organization Framework Convention on Tobacco Control and committed itself to the gradual fulfillment of the relevant obligations. This year, the Ministry of Healthcare of the Russian Federation drafted the bill On the Protection of Public Health from the Impact of Environmental Tobacco Smoke and the Effects of Tobacco Use after it had calculated that about 40 percent of the country’s adult population (44 million people) smokes. Approximately 400,000 Russians die from smoking-related diseases every year. 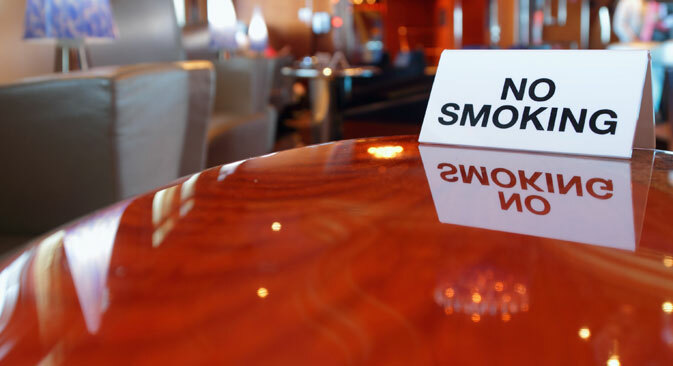 Starting on June 1, 2014, smoking will also be banned in hotels, restaurants, cafes and bars, on passenger train services and long-distance sea journeys, and at commuter rail platforms. Cigarettes will not be available at railway stations and airports (except in duty-free). Retailers may also be reluctant to abide by the law, as banning the sale of tobacco products in kiosks will strip them of their most lucrative business. Shops and special booths will be the only remaining places that sell tobacco after 2014. Moreover, cigarettes will no longer be openly displayed at counters, as they will be replaced by a pricelist. Nonetheless, according to Russian Anti-Tobacco Coalition co-chair Darya Khalturina, tobacco lobbyists managed to make the law less stringent than officials had hoped. For instance: the minimum price of cigarettes will be set de facto by tobacco companies and not the government; duty-free shops have been exempted from the ban; the new law does not apply to tobacco products that are not smoked, such as snuff and chewing tobacco; and the digital cigarette sale tracking system will be based on the data provided by tobacco manufacturers, which are the usual suspects in cases involving counterfeit goods. Despite all this, the law has, in general, been received very positively. “The key victory for the Ministry of Healthcare was the introduction of “smoke-free” programs for public spaces. According to best global practices, this measure alone can reduce the number of heart attacks by 15 percent, while removing cigarettes from display counters can bring teenage smoking rates down by 10-15 percent,” says Khalturina. It is noteworthy that most Russians disapprove of a total ban on smoking in public places. A Levada Center survey has revealed that about 70 percent of Russian citizens support partial restrictions instead of a complete ban. In particular, 16 percent of respondents believe smoking should be prohibited in bars, while 17 percent hold the same opinion with regard to restaurants. About 73 percent of respondents only want to limit smoking, whereas 10 percent think cigarettes should be allowed in bars and 7 percent are in favor of smoking in restaurants.